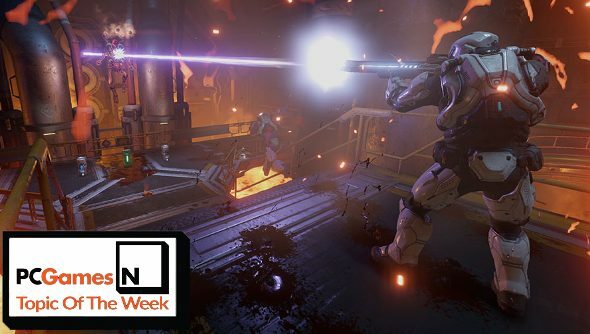 Topic of the Week: Are you interested in Doom’s multiplayer? While Ben is away swanning around Bath, I’ve been given the keys to the Topic of the Week once more. I was going to burn it all down and start up the feature I’ve always dreamed of making: Fraser’s Sandwich Corner, but let’s face it, I’m too lazy. Regular Topic of the Week it is, then. Friends, allow me to broach a subject that has been keeping me up all night, tossing and turning and screaming at the darkness: Doom’s multiplayer, and is anyone actually interested in it? It’s a topic that we’ve discussed in the office a few times now, and the general consensus seems to be overwhelmingly *shrug*. I bounced off it almost immediately, while Jeremy and Ben have spent more time with it, but none of us are exactly excited by its existence. I stopped playing simply because I found it dreadfully boring and conservative, while the others have nicer things to say about it. Take a gander at Jeremy’s Doom beta impressions to see what he thought. My issue was that it didn’t feel enough like old Doom to tickle my nostalgia bone, and isn’t really refreshing enough to draw me away from the multitude of other multiplayer shooters vying for my attention. What I find most peculiar, however, is the fact that Id and Bethesda are really pushing it, while keeping largely quiet about the single-player portion of the game. It strikes me as the least exciting part of a new Doom, a series that I fondly remember for scaring the pants off me while keeping me weaving my way through labyrinthine levels that still shine today, not the limited multiplayer. I could be out of touch, though! Maybe it is all the coolest of people are talking about, in circles I’m not invited into because I want to talk about my sore neck and the hassle of getting a mortgage. What about you lot? Are you excited about Doom’s multiplayer?